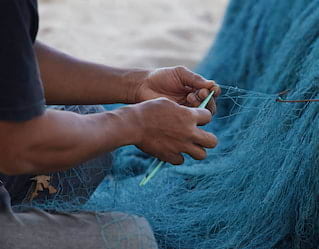 With Belmond Jimbaran Puri as your base, there’s no end of things to do in Bali. Enter swirling night markets scented with lemongrass and galangal, or delve into the island’s Hindu identity with a temple visit. Be it a gourmet cooking class or artisanal tour, there are countless exotic pursuits to enjoy. 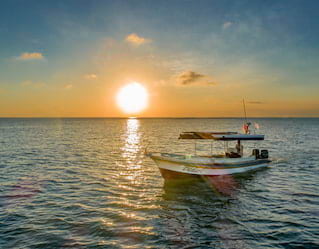 Step aboard our boat, just moments away from the resort, for a two-hour cruise to Uluwatu Temple—regarded as one of the most important in Bali. Sit back and soak up the beautiful scenery, before joining the captain at sundown for a traditional Balinese blessing ceremony. Six guest maximum. 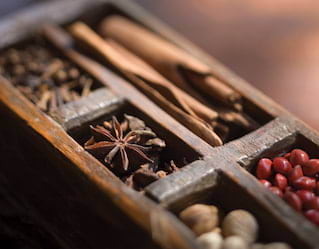 Awaken your senses on a trip to the local market, bursting with fragrant herbs and fiery spices. We’ll guide you towards the most delicious ingredients. Then return to the hotel where our chefs will transform them into a mouth-watering lunch. 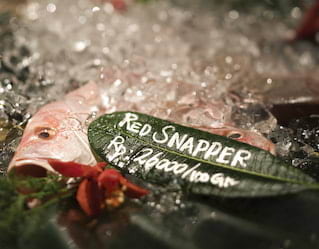 Head to the morning fish market for a flavour of rural Bali. Select your catch of the day, then return for a light breakfast. An immersive cooking class follows with our friendly chef, who will guide you through various regional recipes, before you feast on your efforts. Or, skip the cooking class and go straight to lunch. 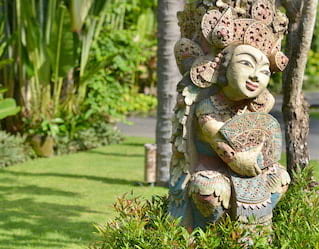 The island of Bali pulses with an artistic spirit. Egg painting is an ancient art. 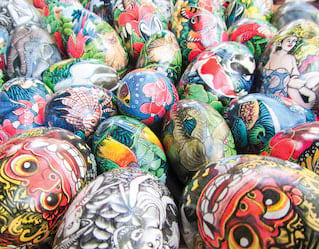 Incredibly delicate and specialised, artisans paint colourful scenes on different types of egg shells in a tradition that honours the beginning of life and its struggles. Every Tuesday and Friday, join us to see a talented third-generation egg painter at work. Immerse yourself in the east’s striking volcanoes and dense jungle. Visit Tenganan village––famous for its batik prints––before bathing in Tirta Gangga’s healing waters. Or head west to discover rural life in the emerald rice paddies. Pura Bratan, a towering water temple on the shores of Lake Beratan, will take your breath away. The Balinese have faith in the healing properties of Mother Nature. Jamu, an Indonesian herbal drink made from the anti-inflammatory herb turmeric, is one of the most popular concoctions. Combined with ginger and natural palm sugar, learn how to make this 5,000 year old health tonic. Gather in our fragrant gardens to visit our on-site temple. Experience the serenity found in typical Balinese prayer while clothed in traditional island dress. You will be presented with offerings to leave at the shrine. Discover the best surf breaks in Indonesia, or take a white knuckle ride on Bali’s jungle rapids––there’s no shortage of activities to get the heart racing. 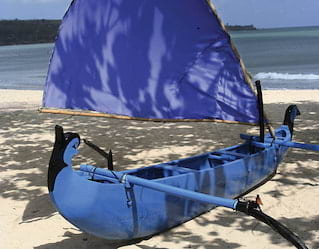 Explore the jungle with a hike and raft combo, or go slow with a scenic lake kayaking excursion. Whatever your pace, our concierge will help ignite your spirit for adventure. 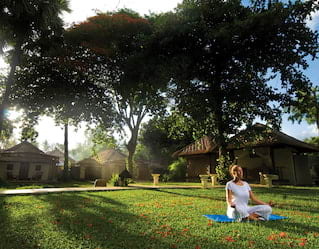 Hosted in the hotel’s lush gardens or on the beach, regular yoga classes incorporate a series of postures or ‘asanas’ that work to harmonise body and mind. Alternatively, activate the body’s energy flow with ancient Tai Chi, or still the mind with a guided meditation. Belmond Jimbaran Puri has something for all ages. Little ones can get creative with kite making, egg painting and sandcastle building. They can stay active with pool dodgeball and non-motorised watersports or be pampered with tailored spa treatments. Or they can get to know the local culture with temple tours and cookery classes. Whatever their interest, they’ll find a new adventure available every day.